A Communicator bugbear of mine (experienced with Communications Server 2007), was the inability to click-to-call via non-UC enabled applications – for the most part , I am referring to the web. Copy and paste was the story of my life (usually this also meant deleting 0’s and adding +’s for e.164 compatibility), my desperation even lead me to this! 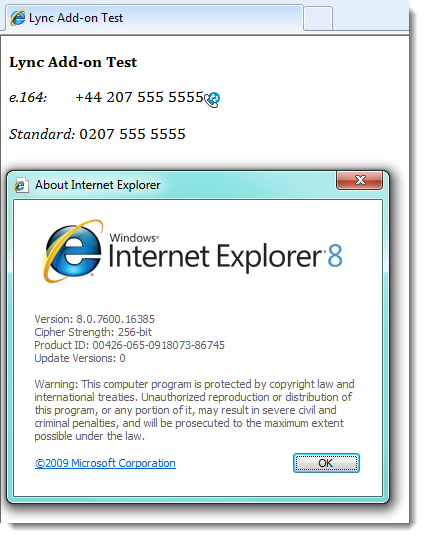 The Microsoft product folks heard me (and others) and during the installation of the Lync client an Internet Explorer add-on is installed to address this problem (see below). 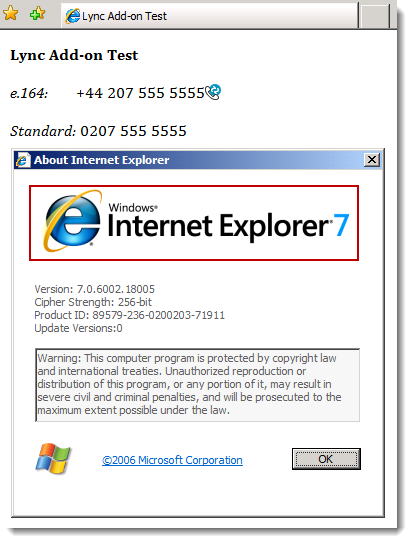 Given this fantastic discovery I wanted to learn which versions of Internet Explorer were compatible and where the detection limitations lied – I limited these tests to versions 7,8 & 9 – I know it is a beta and for those using IE6, shame on you! Finally I pulled out the big guns and road tested my test page with the IE9 beta, the add-on loaded successfully (all be it I was prompted that the browser would start 0.12 seconds faster without it! ), however something was not quite right. 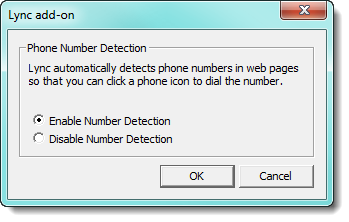 The e.164 number was detected, but incorrectly tagged for invoking a Lync call, essentially the last set of numbers were ignored. 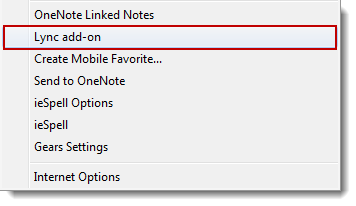 The conclusion is that this first version of the Lync add-on is a welcome addition to the client-side experience, especially where contact page layouts are designed with the e.164 standard in mind – unfortunately there are many where this has not been adhered to. 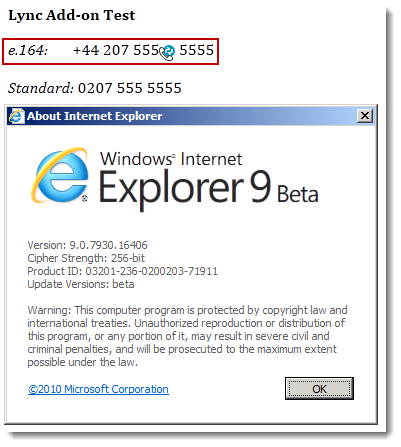 Also be aware that some IE9 based e.164 detection may fail to be detected correctly where inappropriately placed carriage returns are embedded within any contact details.